Empty array errors occur when an array formula returns an empty set. For example, =FILTER(C3:D5,D3:D5<100) will return an error because there are no values less than 100 in our data set. 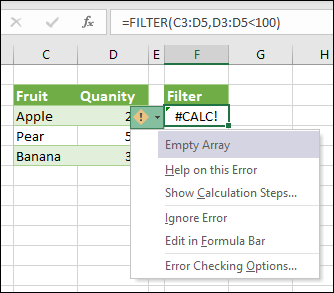 To resolve the error, either change the criterion, or add the if_empty argument to the FILTER function. In this case, =FILTER(C3:D5,D3:D5<100,0) would return a 0 if there are no items in the array.